Roman Catholic apologists often let us know how crucial it is to have an infallible magisterium and church Tradition in order to interpret the Bible and history correctly. With so many Catholic apologists now commenting on sacred scripture, I thought it would be interesting to provide their commentary on the Bible. It doesn't take all that long to find material for these entries. Since Rome doesn't do all that much in actually infallibly interpreting Bible verses, the material is plentiful. The irony of course is that Rome's apologists actually chastise non-Romanists for interpreting the Bible. Very few texts have in fact been authoritatively determined and there consequently remain many important matters in the explanation of which sagacity and ingenuity of Catholic interpreters can and should be freely exercised…” [Source: Dom Bernard Orchard, M.A., ed., A Catholic Commentary on Holy Scripture (London: Thomas Nelson, 1953), p.60, first column (as cited by David T. King, Holy Scripture: The Ground And Pillar of Our Faith Volume 1 (WA: Christian Resources inc, 2001), 223]. The number of texts infallibly interpreted by the Church is small…It has been estimated indeed that the total of such texts is under twenty, though there are of course many other indirectly determined [Source: Dom Bernard Orchard, M.A., ed., A Catholic Commentary on Holy Scripture (London: Thomas Nelson, 1953), p.59, second column ((as cited by David T. King, Holy Scripture: The Ground And Pillar of Our Faith Volume 1 (WA: Christian Resources inc, 2001), 224]. ...the Church by no means prevents or restrains the pursuit of Biblical science, but rather protects it from error, and largely assists its real progress. A wide field is still left open to the private student, in which his hermeneutical skill may display itself with signal effect and to the advantage of the Church. On the one hand, in those passages of Holy Scripture which have not as yet received a certain and definitive interpretation, such labors may, in the benignant providence of God, prepare for and bring to maturity the judgment of the Church; on the other, in passages already defined, the private student may do work equally valuable, either by setting them forth more clearly to the flock and more skillfully to scholars, or by defending them more powerfully from hostile attack [PROVIDENTISSIMUS DEUS, On The Study Of Holy Scripture (Encylical Of Pope Leo XIII, November 18, 1893]. Nick said something funny in the comments down below, and I thought it would be useful for some of you who weren't reading all the comments. Nick quoted JB: To try to suggest that there was doctrinal and administrative unity is a far, far stretch. Then Nick said: This, to me, is where the real issue rests. It's more about our starting assumptions than anything. To you, there is no such thing as "doctrinal and administrative unity" beyond the doors of each local congregation - to you it's a fiction of the Catholic mind. Given that, of course you're not going to even entertain the possibility of it when you read the Fathers or other historic documents. From the Catholic end, your outlook is a form of deism, and I can see why Matthew said some of the things he did about you not really having faith. Again, the six great Bishops and Saints of the Ante-nicene Church were St. Irenaeus, St. Hippolytus, St. Cyprian, St. Gregory Thaumaturgus, St. Dionysius of Alexandria, and St. Methodius. Of these, St. Dionysius is accused by St. Basil of having sown the first seeds of Arianism and St. Gregory is allowed by the same learned Father to have used language concerning our Lord, which he only defends on the plea of an economical object in the writer. St. Hippolytus speaks as if he were ignorant of our Lord's Eternal Sonship; St. Methodius speaks incorrectly at least upon the Incarnation; and St. Cyprian does not treat of theology at all. Such is the incompleteness of the extant teaching of these true saints, and, in their day, faithful witnesses of the Eternal Son. Again, Athenagoras, St. Clement, Tertullian, and the two SS. Dionysii would appear to be the only writers whose language is at any time exact and systematic enough to remind us of the Athanasian Creed. If we limit our view of the teaching of the Fathers by what they expressly state, St. Ignatius may be considered as a Patripassian, St. Justin arianizes, and St. Hippolytus is a Photinian. Again, there are three great theological authors of the Ante-nicene centuries, Tertullian, Origen, and, we may add, Eusebius, though he lived some way into the fourth. Tertullian is heterodox on the doctrine of our Lord's divinity, and, indeed, ultimately fell altogether into heresy or schism; Origen is, at the very least, suspected, and must be defended and explained rather than cited as a witness of orthodoxy; and Eusebius was a Semi-Arian. Moreover, It may be questioned whether any Ante-nicene father distinctly affirms either the numerical Unity or the Coequality of the Three Persons; except perhaps the heterodox Tertullian, and that chiefly in a work written after he had become a Montanist: yet to satisfy the Anti-roman use of Quod semper, &c., surely we ought not to be left for these great articles of doctrine to the testimony of a later age. Of course, as a 19th century writer, Newman goes on at some length like this. These are the "difficulties" that he felt he needed to overcome, in order to justify his assumption that the government of the church then, which Christ and the apostles somehow instituted, is the same as the government that exists in the Roman Catholic church now. These "heterodox" teachings are the "seeds" that developed into the great and perfect faith of the Roman Catholic Church. The WCF: Chapter 1.6: The whole counsel of God concerning all things necessary for His own glory, man’s salvation, faith and life, is either expressly set down in Scripture, or by good and necessary consequence may be deduced from Scripture: unto which nothing at any time is to be added, whether by new revelations of the Spirit, or traditions of men. The WCF: Chapter 3.1: Of God’s Eternal Decree: God from all eternity, did, by the most wise and holy counsel of His own will, freely, and unchangeably ordain whatsoever comes to pass; yet so, as thereby neither is God the author of sin, nor is violence offered to the will of the creatures; nor is the liberty or contingency of second causes taken away, but rather established. After Luther’s “capture”, he wrote Spalatin on May 14th: I sit here idle and drunk all day long: I am reading the Greek and Hebrew Bible.” Marius pg 297 Now, THAT could explain quite a few things. One has no choice but to imagine a drunken Luther working on his “translation” of the Bible into German, the 17th or 18th version available in that native language. Here we have the possibility, if not the probability, of the Martin Luther, the founder of Protestantism, translating the first Protestant Bible while drunk. But then as I mentioned earlier, it sure would explain a number of things in one fell swoop. Now I understand that this admission by Luther himself to being “drunk all day long” goes directly against the “Legend” that Protestantism has built around Him. It also goes against James Swan, who almost certainly knows of this particular quote. “The historical record nowhere documents Luther ever being drunk.” James Swan, “Ten Martin Luther Myths”, 6/30/2007 I’m sure that James, as usual, has an “alternative interpretation” of Luther’s own words, such as that he was “drunk on love of God” or some such other extremely compelling explanation. I am not charging Luther with drunkenness; I am only accepting him at his word, and am placing that admission of drunkenness in the same period of time and at the same location where he did such a “marvelous” job of producing the First Protestant New Testament. Seriously, one has to wonder how James would explain (away) this Luther quote. I think I can guess a few of the possibilities but honestly, I think I am capable of writing his “stuff” better than he can. Quite honestly, it is these kinds of facts about Luther which make the Luther’s “defenders” look to be so blatantly dishonest. One wonders about why someone would say "I am not charging Luther with drunkenness" but also argue Luther was drunk while translating the Bible. The logic escapes me. To my knowledge, the historical record nowhere documents Luther ever being drunk. It does provide evidence that he did regularly drink alcohol, and that he enjoyed drinking. Luther preached and wrote against drunkenness throughout his entire life with vigor and force. On page 297 of Martin Luther: The Christian Between God and Death, Richard Marius states the following, "Yet amid [Luher's] afflictions, he went to work. By May 14 he was writing to Spalatin, 'I sit here idle and drunk all day long; I am reading the Greek and Hebrew Bible. I am writing a sermon in the vernacular on our liberty from auricular confession." Is this evidence Luther's admits his drunkenness? If it is, it's somewhat odd evidence. Marius is in the midst of documenting Luther's exile in the caste of the Wartburg (1521). He documents some of Luther's physical afflictions. He then describes Luther's letter to Spalatin (May 14, 1521). Along with "I sit here idle and drunk all day long; I am reading the Greek and Hebrew Bible. I am writing a sermon in the vernacular on our liberty from auricular confession," he notes Luther was working on the Psalms and a collection of German sermons. Ego otiosus hic et crapulosus sedeo tota die; Bibliam Graecam et Hebraeam lego. Scribam sermonem vernaculum de confessionis auricularis libertate; Psalterium etiam prosequari, et Postillas, ubi e Wittemberga accepero, quibus opus habeo, inter quae et Magnificat inchoatum expecto. This is a perfect example of a comment that if taken literally in a context doesn't make much sense. If you actually read the entire letter, it's precise and cogent. Luther comments on the Edict of Worms, on the student riots against some clergy of Erfurt, and other events. He also says he's reading the Bible in Greek and Hebrew. Marius himself translates the comment as "I sit here all day idle and drunk" (p.517), but then explains it's an example of Luther's hyperbole when describing his ability to drink alcohol. He then adds, "[Luther] may have drunk excessively in these early days in the Wartburg, but he could not have imbibed continually and created the enormous output he produced during his 'captivity.' "
Hartmann Grisar was no fan of Luther. His work is typically classified with the earlier Roman Catholic destructive criticism of Luther, but even he doesn't take Luther literally. Crapulosus properly has this' meaning [drunk], and is so used by Luther himself, Weimar, iii, 559, 596. On the other hand, he also uses it of gluttony: "Sicut ebreitas m1nium bibendo, ita crapula nimium comedendo gravat corda," Weimar, ii, 591. Perhaps "surfeited" comes nearer Luther's meaning in this letter [source]. Prof. A. F. Hoppe, in the St. Louis edition of Dr. Luther's Works, translates them: "I sit here the whole day idle and with a heavy head (schweren Kopfes)." Prof. Dan translates them: "I am sitting idle all day and oppressed with thoughts" [source]. One thing is indeed certain on this topic. For those who wish to vilify Luther, the word must literally mean "drunk." I don't deny Luther drank and enjoyed doing so, but this quote isn't evidence that he translated the Bible drunk. For more on this topic see, Luther's Drinking (Part One). This really isn't about me personally, but I'm willing to put this up for discussion. But I am most interested in talking about "historical revisionism," especially in the context of the papacy, and especially in the wake of my post below, to the effect that the papacy should be abolished. Especially with knowledgeable Catholics who really know what they believe. Another commenter, from that same thread, accused me of being "clueless as to what [Roman Catholic] positions actually are." Well then, in this post and in future posts, I want to state, as clearly as I can, using sources that are as reliably Roman Catholic as I can find, as to what the Roman Catholic position actually is. 1. The pope is the chief bishop, primate, and leader of the whole Church of Christ on earth. 2. He has episcopal jurisdiction over all members of the Church. 3. To be a member of the Catholic Church, a man must be in communion with the Pope. 4. The providential guidance of God will see to it that the Pope shall never commit the Church to error in any matter of religion. According to Fortescue, Catholics don't really have to prove that there was an early papacy, because they believe what they do, really, on the authority of the "living authority" today. But nevertheless, he said, "we have all the evidence we can require that the Catholic Church in the first four and a half centuries did believe what we believe about the papacy" (pg 30). I'm working on posts that look at of each of these issues, because it is important to understand what the early church believed -- "What they knew and when they knew it," to paraphrase a famous Watergate-era senator. So his assumption is that, not only were there snippets and glimmers of a belief in a papacy, but that the four beliefs above were fairly widespread, and only when one of these "points of faith" was "disputed," then did "the Church make her mind clear by defining more explicitly what she has always held." 1. "That our Lord gave these rights to the Apostle St. Peter." 2. "That St. Peter must have a successor in them." 3. "That his successor is the Bishop of Rome." All we suppose, before we come to the Church, is that our Lord Jesus Christ was a man sent by God and whom we must follow if we wish to serve God in the proper way; that he founded one visible Church, to which his followers should belong; that this Church is, as a matter of historic fact, the communion of Rome (not, however, supposing anything about the papacy, but supposing only visible unity and historic continuity). This much must be presupposed and therefore does not rest on the authority of the Church. All else does. (Pgs 26-27, the parenthetical note is Fortescue's). I will grant part of this presupposition to Catholics. I will grant that "Jesus Christ was a man sent by God whom we must follow if we wish to serve God in the proper way." I also understand that Christ founded a church, but I will contest the statement that "his followers should belong" to it. But I would rather say, Christ promised to build a church, an "assembly," against which the gates of hell would not prevail, and his true followers de facto belong to this assembly, which is also called "his body". That is, once individuals "repent and believe the good news" (Mark 1:15 NIV) or they "Repent and [are] baptized every one of you in the name of Jesus Christ for the forgiveness of your sins" [Acts 2:38] or they "Believe in the Lord Jesus" [Acts 16:31] or they "see with their eyes, and hear with their ears, and understand with their heart, and turn" to be healed by God [Acts 28], that Christ himself makes that person "a member of the church" and that this invisible church is the true church. See John 4:23 for clarification -- "But the hour is coming, and is now here, when the true worshipers will worship the Father in spirit and truth, for the Father is seeking such people to worship him. God is spirit, and those who worship him must worship in spirit and truth." That is the "one true church" And as Paul said, it is "us who believe" are the church, the body of Christ (Eph 1:18-19). If anyone wants to contest what I've said here, I'm open to it. But if you want to claim for the church anything more than this, you have to argue for it. And I will strenuously contest that the church is, "as a matter of historic fact, the communion of Rome." It is vital for Roman Catholics to prove that point, and not to simply assume it. Let me pause here to ask if any Catholics believe that I have (aside from how you might argue with my characterization of the church) stated this improperly, or if I have misrepresented anything? 1a. To be the chief bishop, primate, and leader of the whole Church of Christ on earth. 1b. He has episcopal jurisdiction over all members of the Church. 1c. To be a member of the Catholic Church, a man must be in communion with the Pope. 1d. The providential guidance of God will see to it that the Pope shall never commit the Church to error in any matter of religion. 2. That St. Peter must have a successor in these rights. 3. That St. Peter's successor is the Bishop of Rome. Now, do any of you Catholics out there disagree that this is what Roman Catholics of 1920 believed about the papacy? I grew up as a child of Catholic parents whose understanding of Catholicism was shaped in the 1950's, "the real Catholic Moment," according to Patrick Buchanan. And I very much believed these things to be true. Am I mischaracterizing any of this? Do you think that Fortescue is somehow not reliable reporter of what Catholics believed in the 1920's? (or the 1950's? Or ever? Given that he was a prolific writer for The Catholic Encyclopedia.) That he didn't know what he was talking about? Do any of you thoroughly knowledgeable Catholics, you "Catholic Champions" have anything to add to this. Do you wish to contest anything as I've portrayed it here? The last thing I want is to be "clueless." Have I represented your case properly? This is one of the clearest evidences of the inequality of men and women under Islam. Arabic of the Hadith that Majority in Hell are women. These Hadiths (Ahadith – احادیث plural in Arabic and Farsi) that say the majority of dwellers in hell are women. Sahih Bukhari: Vol. 1:28, 301; Vol. 2:161; Vol. 7:124-126. And “Sahih” means “correct”, “right”, “genuine” – these are some of the strongest traditions of Muhammad, the founder and prophet of Islam. The papacy should be abolished. Patrick Henry Reardon wrote the following opinion piece for Touchstone Magazine some time ago. I used to read Touchstone quite regularly -- until they got a Roman Catholic editor, and Peter Leithart seemingly became the one token "Reformed" voice for that publication. So I'm not sure what editorial positions they are espousing these days. But I thought this would be a helpful introduction to what some of the current dialogues are saying with regard to the papacy, as well as some of the historical backgrounds and attitudes. I suggest that the proper model for such an Orthodox dialogue with Rome was provided by the example of St. Mark of Ephesus, the most unforgettable of the Eastern delegates to the Council of Florence back in the fifteenth century. St. Mark is best remembered because of his casting the sole dissenting vote against the reunion of the Church of Rome and the Orthodox Church. At the end, he became convinced that the effort for reunion at Florence would be successful only by an infidelity to the ancient Tradition, so he conscientiously voted against it. Still, St. Mark did not refuse to dialogue and discuss the matter. His fidelity to the true faith did not prevent his taking part in serious theological dialogue with those with whom he disagreed. Even though the Roman Catholic Church was at that time in circumstances indicating great spiritual and moral decline, a decline that would soon lead to its massive dismembering at the Protestant Reformation, St. Mark did not despise Rome or refuse to join his voice to a dialogue summoned to make real that prayer of Christ that we all might be one. Those Orthodox who, like myself, believe that continued dialogue with Rome is a moral imperative, would do well to take St. Mark of Ephesus as their model. At the same time, nonetheless, we Orthodox should be under no illusions about the difficulties attendant on such dialogue. Because Eastern Orthodoxy and Roman Catholicism have followed progressively divergent paths for nearly a thousand years, arguably we are right now farther apart than we have ever been. For example, it should be obvious that the Roman papacy is the major obstacle to our reunion. Make no mistake—we Orthodox do not miss the Roman papal authority, for the simple reason that we were never under it. Not for a minute in antiquity did the pope of Rome ever exercise over the churches of the East the level of centralized authority he has grown, over the past thousand years, to exercise over the Roman Catholic Church. In the East, the pope of Rome was simply the senior among his brother bishops, all of whom taught, pastored, and governed the Church through various common actions, occasional synods, periodic consultations, and other forms of consensual adherence, most of them with only the faintest reference or attention to Rome. The current Roman teaching that all doctrinal and moral questions can be definitively answered and settled by an appeal to Rome is not, the Orthodox insist, the ancient and traditional teaching and practice of the apostolic and patristic Church. If the ancient Catholic Church really did believe in any doctrine even faintly resembling the current doctrine of papal infallibility, there would never have been any need for those early ecumenical councils, all of them held in the East, which laboriously hammered out the creedal formulations, canons, and policies of the Church. The current papal claims, standard doctrine in the Roman Catholic Church since the defining of papal infallibility in 1870 and repeated most recently by Cardinal Ratzinger’s official Vatican declaration Dominus Jesus (released on September 5, 2000), represent an ecclesiastical development radically at odds with the Orthodox understanding of the very nature of the Christian Church as manifest in her ancient life. The “solution” to this problem sometimes suggested by ecumenically minded Orthodox would be simply for the pope of Rome to forswear these recent claims and go back to the humbler status he enjoyed for the first thousand years of Christian history, namely, that of being the “first among equals,” the chief and foremost of his brother bishops, within a Church taught and governed by the broad consensual understanding of an authoritative Tradition. That is to say, many Orthodox would be delighted for His Holiness of Rome, repudiating what we regard as the errors attendant on his recent understanding of his ministry, to take once again his rightful place as the ranking spiritual leader of the Orthodox Church (a position that the patriarch of Constantinople has held since the separation of Rome from Orthodoxy in the eleventh century). One fears, however, that this would be no solution at all. Such a weakening of the Roman papacy would be an utter disaster for the Roman Catholic Church as it is currently constituted. To many of us outside that institution, it appears that the single entity holding the Roman Catholic Church together right now is probably the strong and centralized office of the pope. The Roman Catholic Church for nearly a thousand years has moved toward ever-greater centralized authority, and it is no longer clear that she would thrive, or even survive intact, without that authority maintained at full strength. Anyone widely familiar with Roman Catholic publications these days is well aware that, aside from a general and somewhat vague agreement about the authority of the pope, there are reasons to doubt that there really is a unity of faith among Roman Catholics right now. Weaken the authority of the pope? I would truly hate to see such a thing. For instance, if Rome did not occasionally censure the heretics in that church, just who in the world would do it? Can anyone really remember the last time a Roman Catholic bishop in the United States or Germany or Holland (or elsewhere, for all I know) called to account a pro-gay activist priest, or a pro-abortion nun, or a professor in a Catholic college who denied the Resurrection? No, take away the centralized doctrinal authority of Rome, and one fears that the Roman Catholic Church today would be without rudder or sail in a raging sea. Touchstone also notes that this article, "Dialogue & Papal Strength," first appeared in the October 2001 issue of Touchstone . But it is not available at that link. On the other hand, I do believe it would be in the best interest of the church for not only "a diminished papacy," but also for some future pope, yes, to "repudiat[e]... the errors attendant on his recent understanding of his ministry," and just step down. True, such an act would be a "blueprint for anarchy," but if Reardon is correct, the papacy today merely functions as a Band-aid® on the anarchy that already exists. As Steve Hays has said, only truth is normative. The papacy today does not reflect anything of the truth that Christ preached for his people. It does not reflect the ministry that Peter had in his lifetime, either as a disciple of Christ or as a leader in the nascent church (even if, with Cullman, you think he was a foundational leader). No one in the Apostles' lifetimes had any concept "successors of Peter" or of a continuing "Petrine" ministry. I think the papacy should be abolished. It only harms Christianity. If Protestants of all stripes were to start saying that, and if they start saying why, such conversations are sure to be picked up among the broader Christian culture, and people are sure to start asking "why?" On the verge of the anniversary of the Reformation, I think that that can only be a good thing. What do you think? Luther himself was quite devoted to the Virgin Mary, but the abuse of the cult of the saints in his time led him to encourage a new focus on recourse to Christ himself. Once an abuse is corrected, though, it’s okay to stress again the underlying truth that the abuse exaggerated in such a way as to render false — in this case, the truth that it is the proper work of Christians, in heaven and on earth, in time and out of time, to pray for one another. This reminded me of a person who argues Luther was “extraordinarily devoted to the Blessed Virgin Mary.” The key of course, is the word "devoted." What exactly does it mean in the context of Luther and the saints? Luther didn’t really place a profound emphasis on Mariology. I would deny "Luther himself was quite devoted to the Virgin Mary." This is far too strong when one actually delves into Luther’s Works. Catholic scholar William Cole concurs: “…it would be a mistake to think of Luther as being preoccupied with Mary.” It is striking how little Luther launches into deep theological discussions about the Virgin Mary, and even when he does, they are in most instances, sparse, inconsequential, passing references, or tangential comments. One would think that Luther’s "devotion" would be overly obvious, spelled out in detailed numerous treatises similar to St. Alphonsus Ligouri. Such is not the case. Treatises and passages with the depth of Luther’s early exposition on the Magnificat are few in the totality of Luther’s overall work. The main point of Luther's work on the Magnificat was not even Mariological per se, but rather a treatise to understand God’s work in law and gospel. True, the reason for this lack of emphasis on Mary is that Luther abandoned the most significant aspect of Roman Catholic Mariology: the intercession of Mary. Truly, this is the doctrine that defines Roman Catholic Mariology. It helps defines the “devotion” Roman Catholics partake in, making Mary crucial to the Romanist layman’s normal Christian life. Catholics invoke Mary for help, protection, and praise her attributes. For them, the invocation of Mary gives deep significance to such things like Theotokos, perpetual virginity, and the Immaculate Conception. These attributes are seen as worthy of praise, and serve to show the great divide that separates a saint from an average mortal. No one can deny that by such saint worship we have now come to the point where we have actually made utter idols of the Mother of God and the saints, and that because of the service we have rendered and the works we have performed in their honor we have sought comfort more with them than with Christ Himself. Thereby faith in Christ has been destroyed. [Martin Luther, D.Martin Luthers Werke: Kritische Gesamtausgabe, Abteilung Werke 11:415 quoted in MartinLuther, What Luther Says, Vol. III, ed. Ewald Martin Plass (St Louis: Concordia Publishing House, 1959), 1254]. Luther had set the style for Protestants when he attacked the Catholic prayer "Hail Holy Queen" which he regarded as blasphemous. "Your prayers, 0 Christian," he says, "are as dear to me as hers. And why? Because if you believe that Christ lives in you as much as in her, you can help me as much as she." Eventually Luther was led to limit the communion of saints to the Church on earth because of his complete rejection of any intercessory power on the part of the saints in heaven [Juniper B. Carol (ed.) Mariology Volume 2, 195]. If the Lutheran pastor has any historical information that Luther was simply attacking the abuse of "the proper work of Christians" in praying to dead saints, I'd like to see it. That is, if Luther positively affirmed the practice of a correct way to pray to saints for their intercession, I'd like to see it. In fairness to the Lutheran pastor making these claims about Luther and the saints, I haven't heard the sermon in which he explained his view. I looked around for the sermon on his web page, but didn't see it. If anyone finds it, let me know. This weekend I made the acquaintance of the most educated and consistent Romanist I've ever met in person, and he's not an academic-type either; he's an electrician. In the course of our discussions, I asked him a question I enjoy asking people, ripped straight out of the Way of the Master playbook - "I'm curious, if you were to find me lying on the sidewalk, no one else around, with a knife in my back and I had 3 minutes to live, what would you tell me?" He started with: "Well, I'd ask you if you've been baptised." I said: "I tell you 'no, I haven't.'" Him: "Then the church says that in emergencies if there's no one of authority around, anyone can baptise." Me: "And if there's no water around?" Him: "The church recognises such thing as a 'baptism of desire', but in fact, I carry water around in my truck for just that contingency." “For example, "the Word was God" was interpreted as "the Word was a god," which is possible in Greek.” This was claimed in the context of saying the Jehovah Witnesses follow Sola Scriptura and the claim that we need an infallible council of an infallible church with an infallible church in order to interpret Scripture properly. Actually, it is not really possible with a sound knowledge of Greek. It is only “possible” for those with a very shallow knowledge of Greek, who don’t understand the intricacies of the definite articles and predicate nominative issues. If one only has a beginning knowledge of Greek, it is very dangerous. The grammar and Greek syntax of John 1:1 determines the right theology. The doctrine of the Deity of Christ and the eternality of the Son is based on Scripture, not the Council of Nicaea. The Council of Nicaea is based on Scripture, and derives secondary authority from the only infallible authority – the Scriptures. Then he clarifies later from his controversial, heretical, and inflammatory title. He says they were right if they mean “the Father is not Jesus”; ie the same person; but they are not right in that the JWs deny that Jesus is God or Deity. The predicate nominative issue is the key interpretive issue, more important than the definite article issue. The Word was God. “We know that “the Word” is the subject because it has the definite article, and we translate it accordingly: “and the Word was God.” Two questions, both of them of theological import, should come to mind: 1) Why was θεὸς (Theos) thrown forward? And 2) why does it lack the article? In brief, its emphatic position stresses its essence or quality: “What God was, the Word was” is how one translation brings out this force. Its lack of a definite article keeps us from identifying the person of the Word ( Jesus Christ) with the person of “God” (the Father). That is to say, the word order tells us that Jesus Christ has all the divine attributes that the Father has; lack of the article tells us that Jesus Christ is not the Father. John’s wording here is beautifully compact! It is, in fact, one of the most elegantly terse theological statements one could ever find. As Martin Luther said, the lack of an article is against Sabellianism [Modalism]; the word order is against Arianism. So, here we have the principle of Sola Scriptura as the basis for all sound doctrine and theology. The first four Ecumenical councils were right, only because they got the Bible right. We don’t need Popes or any idea of an “infallible church council”. 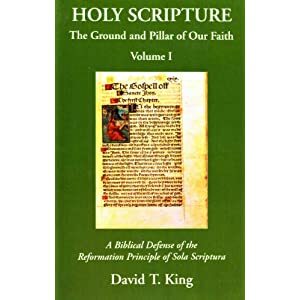 The Scriptures themselves teach us sound doctrine, and the good and right decisions in the Ecumenical councils derive their rightness from Scripture itself. Only Scripture is infallible. Here we see the Greek grammar and syntax teaching us the distinction between nature and person. God revealed the doctrine of the Trinity based on the Scriptures alone; Sola Scriptura stands. 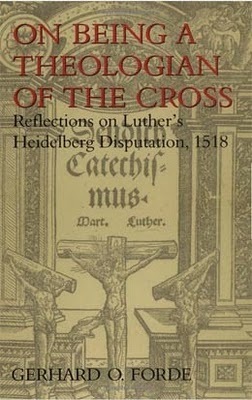 About two years ago I loaned the book On Being a Theologian of the Cross: Reflections on Luther's Heidelberg Disputation, 1518 to a good friend. I haven't seen it since. I was pleased to see that Google books now has it available, and it appears to be back in print. 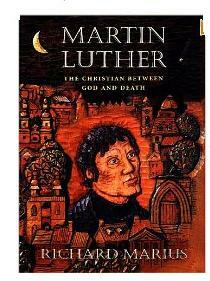 This is one of my favorite Luther-related books. It isn't as dull as it sounds. In fact, I'd rather someone read this small book than an in-depth treatment of Reformation history. This book taught me one of the main arteries of Luther's theology: the distinction between glory and the cross, and those "theologians" that espouse one or the other. The theology of the cross is a theology of foolishness. It denies man’s wisdom and works; it rests totally upon Christ’s work. Indeed, it really does sound silly to think that salvation is found only through faith alone. Shouldn't we have to do something? Hasn't God given us an innate ability to reach out to Him? Or, hasn't God poured out some sort of enabling grace through a sacrament that frees us to make a choice to serve him? The theologian of the cross says no. God doesn't need our help at all. He saves by grace alone through faith alone. God explained it in of all things, a book. Imagine that: God almighty explained Himself for us, not in a majestic show of power and grandeur, but in frail book. In that book, He explained how God himself, the most supreme power and creator of all things became a helpless baby in a crib. He grew up to be hung on a cross, naked, weak, and suffering. God almighty was killed as a common criminal. He then rose from the dead. The book then details that savingly believing in His perfect active and passive work, peace is made between the Holy God of the universe and the sin-burdened human being. This is the foolishness of the theology of the cross. All the worlds’ religions reason that God can only be appeased by some work on our part. But a theologian of the cross finds it is only in God’s action where we find salvation. On the other hand, the theology of glory is founded on man’s wisdom and works. It is a worldview that seems “sensible and right” by worldly standards. Glory theologians have to "understand" by the use of reason, and they have to “do” by their own moral energy to be right with God. God's a fair guy, they "reason." A fair God would enable us to at least be able to do "something" to save ourselves. Wouldn't a smart God would want an infallible official to lead His people? I mean, simply leaving a book and an fallible person in charge of the church seems.... utterly foolish. People wouldn't be able to know anything certain with just a book and some fallible people running a local church. That's just stupid. A smart God would set something up like a small kingdom, governed by an infallible head. He'd probably send glorious signs and wonders to prove it's His set up. That would be the smart thing to do. In fact, one of those miracles could be something like the body of woman in a glass case that doesn't decay after 100 years, or perhaps a holy woman could appear here and there and give new signs. That would be wise, wouldn't it? Everyone needs more proof than just... what's stated in a book. First he encountered the glory of “human reason” expressed in his earlier scholastic training. Scholastic theology had been strongly influenced by Aristotelian metaphysics, and this influence had misshaped the Biblical method. Think of the confusion caused by the Quadriga's fourfold interpretation of Scripture and it's ability to obscure the Gospel. Secondly, Luther was confronted with the glory of human effort (works). He encountered this in his monastic order. Think of the counsels of the perfect. Imagine people believing that they could perform works to attain a standard of holiness that would allow them to stand before a Holy God, or that some such sacrifice in this life makes one "a saint" in the next. Thirdly, he also rejected the “glory of the church” and said the church is a suffering church, rather than a church of beauty and splendor. The church is not supposed to be a “glory” of political power and luxury, which it was during Luther's lifetime. The glory theologians of Rome are still with us. They glory in all three of these things. Modern-day Romanists still apply their glory of reason to the Scriptures. I recently read a comment from a Romanist who admitted Mary's perpetual virginity isn't explicitly taught in Scripture. 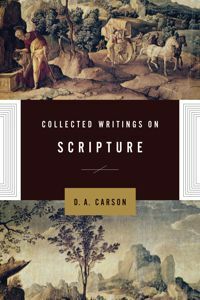 "Tradition" has to be hoisted upon the Bible so implicit implications can be drawn from the text. Another Romanist posits the Bible is materially sufficient, in that every true doctrine must be in harmony with it. What makes a doctrine "true"? Why it's none other than what the Roman church says. There is of course still the Romanist glory of works. But wait, they say those works they do are prompted by Christ, or done with the help of the Holy Spirit. Hogwash. They are a denial of the perfect work of Christ. Only perfect works are those that can be presented before God. There are no works that can be added to Christ's perfect work. There is also glory in the Romanist church. The multitude of conversion stories "prove" how glorious the "home" of Rome is. The conversion stories glory in their ability to find the promise land here on earth, and how great and wonderful this earthly kingdom is. Rome's apologists and defenders are still theologians of glory. They stand opposed to the foolishness of the cross, and actively work against God's kingdom. However well-meaning, they are ultimately deniers of the perfect work of Christ. 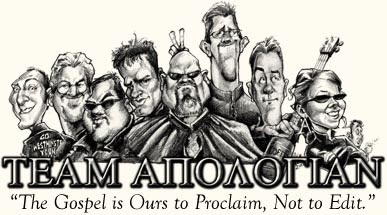 All their websites, blogs, discussion boards, seminars, books, tracts, etc., are examples of the theology of glory. That's a foolish thing to say, I know. Don't we just see thing a bit differently than the Romanists? Consider me a fool. I would rather be thought a fool than to deny Christ's perfect work. Matthew Bellisario: In fact, all St. Paul had was the Old Testament which was written in Greek, known as the Septuagint, and his interpretations were accepted by the illumination of the Holy Spirit, given to him by the authority passed down to him through the apostles. If you recall, even after Our Lord called him, he still went to have hands laid upon him to receive the apostolic authority and gifts of the Holy Spirit. (Acts 9:17-19) Only then was he “sent.” How was Saint Paul able to convert people without a Bible? The answer is simple, he did so by the authority of the apostles which were given authority to preach the Gospel from Christ Himself. God calling and sending Paul prior to any laying on of hands, Acts 9:13-19: But Ananias answered, "Lord, I have heard from many about this man, how much evil he has done to your saints at Jerusalem. And here he has authority from the chief priests to bind all who call on your name." But the Lord said to him, "Go, for he is a chosen instrument of mine to carry my name before the Gentiles and kings and the children of Israel. For I will show him how much he must suffer for the sake of my name." So Ananias departed and entered the house. And laying his hands on him he said, "Brother Saul, the Lord Jesus who appeared to you on the road by which you came has sent me so that you may regain your sight and be filled with the Holy Spirit." And immediately something like scales fell from his eyes, and he regained his sight. Then he rose and was baptized; and taking food, he was strengthened. Paul on his own calling: But when he who had set me apart before I was born, and who called me by his grace, was pleased to reveal his Son to me, in order that I might preach him among the Gentiles, I did not immediately consult with anyone; nor did I go up to Jerusalem to those who were apostles before me, but I went away into Arabia, and returned again to Damascus. … And from those who seemed to be influential (what they were makes no difference to me; God shows no partiality)—those, I say, who seemed influential added nothing to me. Darrel Bock, Commentary on Act 9:17-19: It is significant that here a non-apostle is the mediator of the Spirit. The church's ministry is expanding in ways that mean that non-apostles will do important work. If it could be proved that the early Church believed, as part of her faith, the contrary of what we believe now, or anything logically incompatible with our belief, this would be exceedingly serious; it would, indeed, be the refutation of our position, since we maintain that the faith does not change. But it is not at all the same thing, even if it were true, to say that we could not prove that the early Church did believe what we believe now. Suppose, for the sake of argument, that we could find no statement of any kind about some dogma; this would not affect our position. There would then be no proof, either for or against the dogma, in the given period. We should believe it all the same, because of a definition made at another time (29). In other words, he is saying, "if we don't find anyone supporting our belief, that's ok, because it doesn't actually disprove what we believe, and we can still assume it was there." And those of you who read this blog know that that's a pretty fair summary of how Catholics can tend to argue some things. As I've studied these issues, I believe there is a whole raft of things that demonstrate beyond a shadow of a doubt that the early church had no idea that there was anything like a pope. But let's just play "make-believe" for a moment and allow Fortescue to outline his claims. What Are the Papal Claims? These are things that he claims the earliest church (prior to 451) believed. But these are the "theses to be proved." It will be useful to go through each of these four at some point -- the arguments that Fortescue has made, and address his reasoning in each of these cases. In choosing the year 451 as his stopping point, Fortescue quietly covers over a pivot-point that greatly changed life for the bishop of Rome, and that would, of course, be the conversion of Constantine. At that point, bishops of Rome went from a position of at best, neutrality with the state and at times, from being violently persecuted, to being, cording to Roger Collins, "functionaries of the state." For his evidence in favor of a papacy prior to Constantine, Fortescue relies heavily on Clement, which I mentioned in an earlier post, and Cyprian. Subsequent scholarship -- even Catholic scholarship -- have greatly tempered any notion that these examples support an early papacy. My hope is to discuss all of these things in the coming days and weeks. One reason why I am focusing on the papacy at this point, and particularly the earliest papacy, is because it is, I believe, the weak, soft underbelly of the Roman Catholic edifice. And it will be important, in the context of all the talk about the Reformation that we'll be seeing as the 500th anniversary of Luther's 95 Theses comes up. Luther began his work by being a loyal subject of a pope. Very many things crept up on him, and in many ways, he had to develop his theologies about them "on the fly." But if Luther had had a proper understanding of the papacy going into his efforts, it would have clarified things greatly for him, and for the world around him.